We now offer a complete robot cell for a package price. Robot (Used serviced ABB IRB6400 / 2.5 120kg S4C controller). 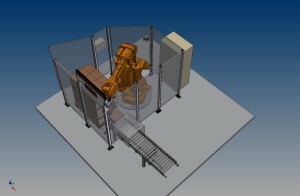 Machine protection fence with light curtain for outfeed of pallets. Documentation, user manual and backup software included. CE marking on site with the customer. 1. An empty EUR pallet for the robot to pile on are placed inside the robot cell. 2. In the robot cell material is fed forward through a conveyor belt. 3. The robot retrieves the advancing material. 4. The robot stacks it on the empty EUR pallets placed inside the robot cell, the robot do this using the supplied vacuum gripper. 5. 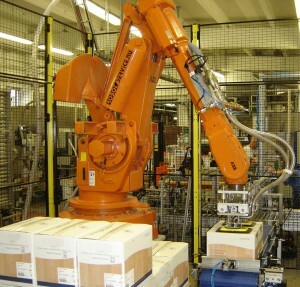 Once the robot has filled the EUR-pallet to the preset height, the robot stops and goes back to home position. 6. The filled pallet is collected by a truck manually through a light barrier or gate. 7. 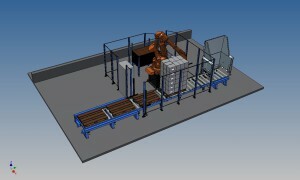 A new empty EUR pallet are placed in the robot cell and the robot continues to pile. Pattern laying of materials such as cartons, cans, boxes, buckets and boards etc. Selecting the maximum height the robot can stack, before the pallet is to be replaced. Where the home position is. * Power supply 3x400VAC 16A. * Compressed air 6-8 bar.